The Seminar was held on 25 January 2008 at New Delhi. Key speakers at the Seminar included Rear Admiral R Bajaj, Assistant Chief of Material (IT&SYS), Indian Navy, Cmde KLN Chary, Principal Director Information Technology, Cmde BR Taneja, Commanding Officer, INS Valsura, Gp. Capt. S V Phatak, Director, IMMOLS, Indian Air Force, Cmde HQ Harsha, DACODS (IW & IT), Integrated Headquarters, Ministry of Defence (Navy) etc. 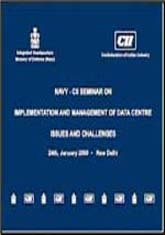 The Seminar focussed on issues such as the Navy’s perspective on data centres, technical and infrastructural management and case studies on management of data centres.